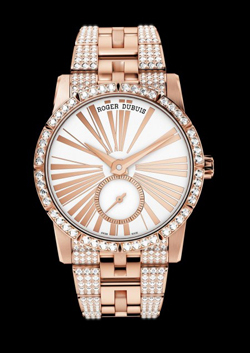 After the first advance SIHH 2013 Roger Dubuis, here’s the second: The new luxury watch Excalibur 36 in pink gold with diamonds, it adds to the Roger Dubuis collection a touch precious. Adorned with 672 diamonds (approx. 4.78 carats), Excalibur 36 shines with lights. His identity codes – dynamic shapes, sharp angles and strong design – help to create a style that combines sophistication and high-end timepieces, without sacrificing style of the Maison in Geneva. Women are the heroines of Roger Dubuis. For them, watches Roger Dubuis has created an exceptional timepiece, a veritable ode to femininity. Excalibur 36 in rose gold offers a unique mechanical watch accompanied by a design with strong lines. The craftsmen of the brand have gone further to imagine creating this ultra precious whose charm is matched only by his virtuosity. The clock embodies the pioneering spirit that characterizes Roger Dubuis and exudes excellence jewelry. It abandons the preciousness and beauty extreme with his bracelet adorned with 624 diamonds for a total of about 3.79 carats. The precious stones surrounding the center of the bracelet polished in two symmetrical rows diamonds. The magic continues on the bezel adorned with 48 diamonds for a total of approximately 0.99 carats. Reflecting this sparkling dance, the clock is dressed in pink gold to the Roman numerals on the dial and applied gently circle around the small seconds at 6 o’clock. Because excellence remains the foundation of this building, the clock has a mechanical movement with automatic generation signed Roger Dubuis: the caliber RD821. With its 172 components, beats hours, minutes and seconds precious, relying on a power reserve of 48 hours. The Excalibur 36 also benefits from an extraordinary recognition as shall have been awarded the prestigious Hallmark of Geneva. The caliber RD821 is also certified by the Swiss Official Timekeeping (COSC). Treasure trove of extraordinary technical mastery and creating exceptional jewelry, the Excalibur 36 is destined for a bright future. Burns with boldness, in the glow of diamonds forming a disk light on the bezel and bracelet. The glitter of the time there is laid to remember the uniqueness of every moment.